I'm a machine girl. If there's a way to do something by machine, that's how I do it. So when a bit of handwork looms on the horizon, a happy little needle case helps to get me in the mood fast. I have a cat named Lucy, and she can be a bit of a vixen at times. Even so, she's so stinkin' cute that I can't bring myself to discipline her even when she's been naughty. I guess cats just make me happy. So when it came time to make a new needle case, I decided to put a cute little kitty face on it. Interior fabric: One 3-1/2" x 6-1/2"
I like to use a sandboard to prevent my squares from shifting while I mark them. Place a Cat Ear square on the upper left corner of the Cat Face fabric, RST (right sides together). Sew on the diagonal. Flip and press. Repeat for the other ear, placing it in the upper right corner. Continue this same process, sewing the Cat Base squares to the lower left and right corners. 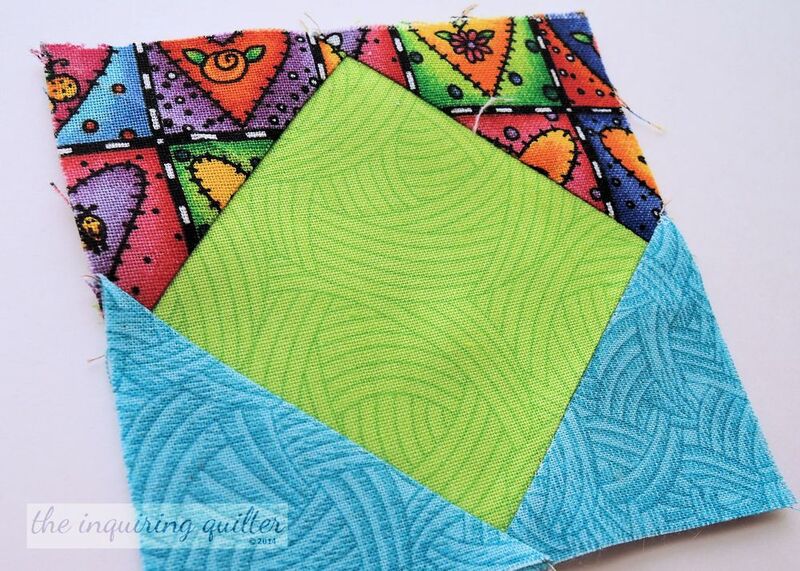 For the back of the needle case, you’re actually making a modified square in square block. Place a Cat Base square on the upper left corner of the Cat Back fabric, RST. Sew on the diagonal, flip and press. Repeat, sewing the remaining Cat Base square to the upper right corner. Arrange the Cat Face and Cat Back squares as shown, with the Cat Base sides closest to each other. Place the cat back square on top of the cat face square, RST. Pin, and sew along that cat base side. To match everything up perfectly, I shoot a pin straight through the point on the Cat Back square. Then I push the pin through the point on the Cat Face square. While holding this pin straight so nothing shifts, I very carefully pin on either side of the pin locking everything in place for sewing. As you sew, sew through the X formed by the corner seams. Doing so will make the points on your square in a square blocks come out nice and sharp. Since there are so many seams coming together here, press the seam open to reduce bulk. Lay the two nose triangles RST. Sew along two straight edges, and not along the bias. Trim the point, turn right side out, and press. Trim the dog ears. Following manufacturer’s instructions, fuse the interfacing to the back of the interior fabric. Lay the nose triangle on top of the front piece. Place the triangle at the bottom of the Cat Back square as shown, centering it and aligning raw edges. Pin and sew with a long basting stitch using 1/8” seam. Lay the felted wool/felt/fleece on the right side of the back piece, centering it. Pin, and sew using 1/8” seam allowance. Sew across the middle of the needle area to help secure it. Lay the back piece on top of the front piece, right sides together. Pin and sew around the edges, leaving a space open for turning. Be sure to backstitch at the beginning and end of your stitching. Trim the corners and turn the needle case right side out. 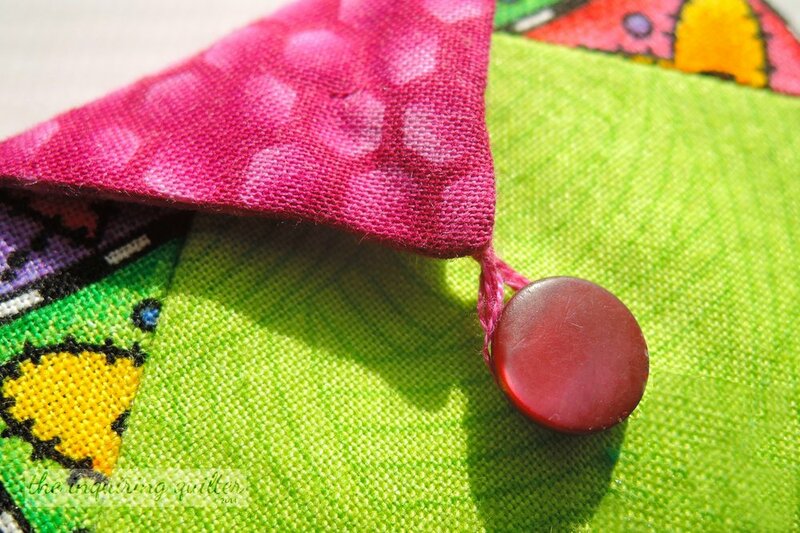 Use a chopstick or knitting needle to poke out the corners so they are sharp. Press. Using three strands of embroidery floss, form a loop and sew the floss loop to the back of the nose piece. Fold over the nose piece and mark the position of the nose button. Sew nose button to the kitty face. Using a single strand of embroidery floss and a backstitch, stitch the mouth on your cute kitty. Lightly sketch the mouth, and then just follow the line! Following the same procedure as the mouth, lightly sketch the whiskers. Then use a single strand of embroidery floss and a backstitch to stitch the whiskers. Don’t feel like you have to use black—feel free to experiment with color. Iron fusible to the back of your white fabric scrap and the scrap you chose for the iris color. Trace 2 large circles on the back of the white fabric and 2 smaller circles on the back of the Iris scrap. I used two buttons, one larger than the other, to trace my circles. Cut out all 4 circles. Fuse the iris on each white eye. Cut small bits of white and fuse them to the irises to add a glint to each eye. Positon and then fuse the eyes in place. One final touch and then we’re through! Iron fusible to the back of the Tail fabric scrap. Sketch a flippy tail on the back of the Tail fabric, cut it out. Fuse the tail onto the back of the needle case.